So…saw this in the grocery store. Yep. The grocery store. No, it’s not a service dog or a therapy dog. I know that from the conversation being held at the checkout. Just a regular dog, albeit a really cute one. Hanging out in the grocery store. Where food lives. I suppose that’s better than leaving it in a hot car. Oh, who am I kidding? That’s a hell of a lot better than leaving it in a hot car. But not nearly so good as leaving it at home prior to going shopping. Food shopping. Where food is. That other people might also like to buy. Food. That dogs haven’t been around. This entry was posted in Everyday Musings and tagged dogs, humor, life, observations. Bookmark the permalink. I suppose, As long as it doesn’t leave a present behind eh? This is strange but maybe it has a harness so is somehow a therapy dog for a kid? All conjecture but no proof. . . The conversation at the checkout was that the owner didn’t want to leave it in the car, not that it was a therapy dog. The harness I’m sure was meant to be decorative, even had a pretty little bow on it (can’t see it in the photo), looked like one of those designer things with lots of sparkly gems on it. Was really a cute little dog. Yeah, that was my feeling. I love animals of all kinds and love my dogs to no end, but I wouldn’t take them grocery shopping. Of course I wouldn’t leave them in the car either, so I give her points for that (major points). 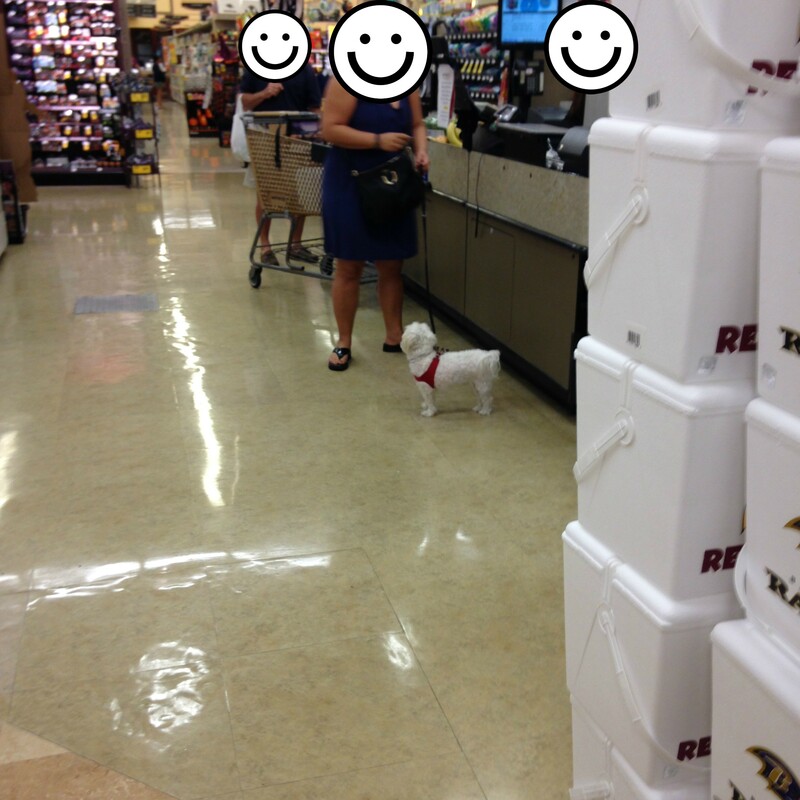 Then again, a trip home would’ve been in order before going to the grocery store…no matter how cute the dog. He or she is wearing a vest/cummerbund/jacket so this is undoubtedly a case of the emotional support dog needed for shopping. Do people not consider that their pets might be happier at home rather than being dragged everywhere? I only rarely take my dog in the car unless we are going somewhere for her benefit, like a park for walking. The only store I’ve ever taken her to was an outdoor garden centre. Except for the color and sparkly things and the big plaid bow on the one this dog was wearing, my dogs have very similar padded harnesses (oh, scratch that, I mean vests). 😀 I didn’t realize it was indicative of a therapy dog. Plus given the conversation that was going on…it definitely didn’t seem like a therapy dog. My dogs love going for car rides (especially to Grandma’s house! ), but like you, I limit where we go. I usually only take them to the park for walks on cool days or to the aforementioned grandmother’s house for spoiling…definitely not shopping or any kind of a store. Is it legal to take dogs into a supermarket? It’s not here unless it is a service dog. Food hygiene regulations say that “no animal is permitted” on premises where food is prepared or sold. The owner of the premises and/or the dog owner can receive hefty fines for contravening the regulations. As far as I know it has to be a guide/service or therapy dog here in the U.S. as well. At least in most establishments (some places are dog friendly, however, certainly NOT grocery stores). But it’s my understanding that you do not have to prove your dog is a service or therapy dog or explain why you need a service or therapy dog. All you have to do is say the dog IS one and the owner of the establishment (or the taxi cab or the bus or wherever it is you want to take the dog) can’t ask you any other questions or ask to see proof. At least that’s how I understand the law (I could be wrong…I am very often wrong…but I believe I have it right). The dog needs to stay home. Where is the health department when it’s needed. I might report the store to the health department. Yet another to file in the “Are People REALLY This Freakin’ Ignorant??! !” file. I know. I just saw another one the other day. I long haired chihuahua sitting in the front of the cart (where you’d put your baby or child) sitting on the woman’s pocketbook just hanging out. One more reason to make sure to carry antibacterial wipes everywhere and wipe down those bars (on the carts) kids are always putting their hands and mouths on. Some people, Wendy, just realize there’s a big world around them that doesn’t play by their rules. Oy. This is too much. I still say yuck. There are service animals who are absolutely needed, certainly, but this was clearly a pet just along for the ride. Yeah. No need for this.